This DPI map shows the highest and lowest 3-year dropout rates by district. Districts in the northeast and southeast had the highest dropout rates, as well as the highest rates of short-term suspensions, or suspensions lasting 10 days or less. DPI researcher Kenneth Gattis says suspensions may be one factor in dropouts that are within a school's control. "Suspension is a school decision," he told the State Board of Education at Thursday's meeting. "And there has been a correlation for a number of years with dropout." The map from the DPI report shows the highest and lowest 3-year suspension rates by district. Statewide suspension rates also rose for the first time in seven years. As in previous years, black students received the most suspensions. In 2014 schools suspended 118,105 black students. White students received 54,812 suspensions, the second-highest number among racial groups. 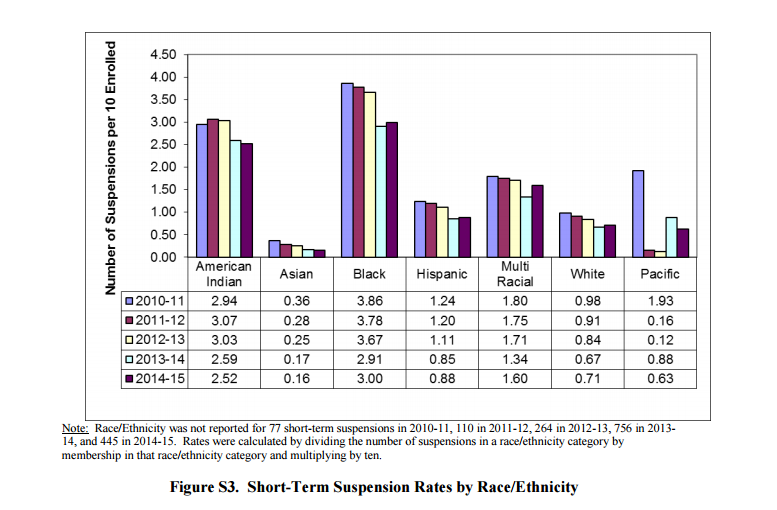 Black students' short-term suspension rate was triple that of white students. American Indian students' rate was two and a half times greater. Former teacher and State Board of Education advisor James Ford had questions about the disparities at Thursday's state board meeting. "Why are we still experiencing such racialized gaps in the short-term and long-term suspensions?" Ford asked. "Even as we are trending down, we haven't closed those gaps." State Superintendent June Atkinson says North Carolina's relatively inexperienced teacher population is one reason for the racial gap. "They need extra help and assistance to deal with cultural diversity--to be able to use better classroom management, discipline, positive discipline." Board members say they plan to hold a deeper discussion about the disparities in the coming months. A graph from the 2014-2015 DPI report on suspensions, crime and dropouts shows black students received a disproportionate amount of suspensions. The school crime rate rose last school year by 1.5 percent—the first increase in five years. Rates of crime are distributed relatively evenly across the state. The most common offenses were having a controlled substance and having a weapon, other than a firearm. Incidents of corporal punishment, or paddling, rose about 20 percent last school year to 147 students, 80 of whom were American Indian. The paddling took place in four counties: Robeson, Graham, Swain and Macon. Robeson and Graham accounted for 92 percent of the paddling incidents. Both have high populations of American Indian students.